This presentation is a personal account of what happens when your personal and professional life collide. 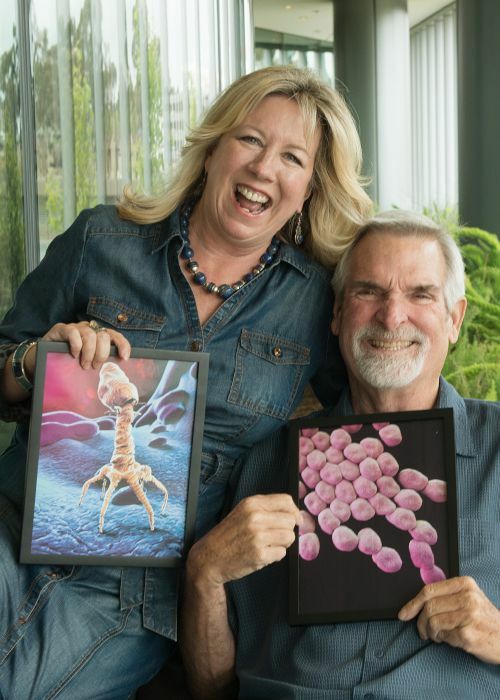 When UCSD psychiatry professor Tom Patterson acquired a deadly Acinetobacter baumannii infection on vacation that was resistant to all antibiotics, his wife, Steffanie Strathdee, an infectious disease epidemiologist, pulled out all the stops and tried to save him using a 100-year-old forgotten cure: bacteriophage therapy. The speakers will share their gut-wrenching journey and the scientific backstory about how phage researchers from around the world came together to save Tom’s life. The presentation will also present the lessons this valuable case provides as it has helped propel phage therapy forward as a promising therapy for treating ‘superbug’ infections in the 21st century. The IGI seminar series features a diverse range of speakers focusing on a variety of topics related to the Institute’s research programs. Following all seminars, attendees are invited to stay for a free lunch and talk with the seminar speaker.